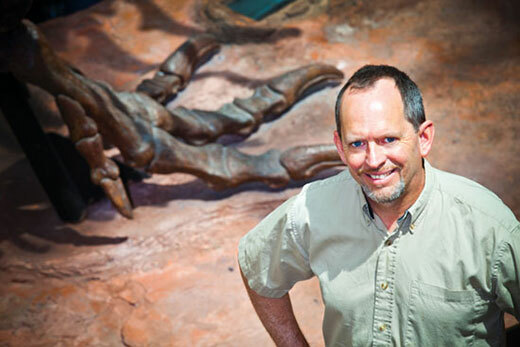 The latest paper by Emory paleontologist Anthony Martin describes the first dinosaur tracks found in Victoria, Australia -- way back in the 1980s -- and explains their paleontological importance. Paleontologists don’t always have to go into the field in search of fossils to identify. Sometimes they dig through the collections of museums. That was the case for the latest paper by Emory paleontologist Anthony Martin, published in the journal Memoirs of Museum Victoria. Martin describes the first dinosaur tracks found in Victoria, Australia – way back in the 1980s – and explains their paleontological importance. The three footprints, made by small ornithopods, were recovered in Lower Cretaceous strata of the Eumeralla Formation of Victoria, dating to about 105 million years ago. One of the tracks was found at Knowledge Creek in 1980 by paleontologists Thomas Rich and Patricia Vickers-Rich, a husband and wife team. The other two prints were spotted in 1989 at Skenes Creek by geologist Helmut Tracksdorf. Martin’s study appears in a special volume honoring the career of Thomas Rich, a long-term mentor of Martin. Victoria is famous for its polar dinosaur bones, which washed downstream during torrential spring flooding and were deposited on the banks of rivers, far from the sites where the animals actually lived and died, Martin explains. Tracks, however, pinpoint where the dinosaurs actually set foot.